The first Banff Marathon was scheduled for last June. The route was marked, aid stations readied and people, not just from Canada, but all over the world had arrived in town to run. Then the rains came. The Bow River flooded causing massive damage to Highway#1 and towns and cities along its route. Friends of mine from the Sudbury Rocks Running Club, in Ontario, had flown in to run the race. One of them, Vince, was my mentor when I had started running in 2002 and I had most recently run with him in the 2011 Prince Edward Island Marathon. They ended up on flood watch. But, you can never hold a good marathon down and the folks who organized last year’s effort were back for 2014. This would definitely be the inaugural Banff Marathon and hopefully nothing would stop it. The scenic course runs through one of Canada’s iconic national parks. The planned route follows the Bow Valley Parkway, the Legacy trail, and finishes in downtown Banff. Banff national park is designated as a UNESCO World Heritage site and, because the area is protected, the race is limited to 1,500 entrants. This is the only marathon in North America contested completely inside a national park. This year’s race was on Sunday June 22nd and the night before I received an email from the organizers. The heading caught my attention, IMPORTANT INFORMATION: ROUTE CHANGE. We had had no flooding this year so what could be the issue? I soon found out. The message stated that “We have a female grizzly with two young cubs in the Vermilion area. It appears that she is successfully hunting elk calves and is seeking security from three large males. It is probable that she will have a very low comfort level near any humans due to her wary nature”. The race was still on but we would run in the opposite direction. Good move. My running buddies had returned from Sudbury and on a sunny Sunday morning I met up with Vince at the start line. The gun went off at 10.00am and we headed out, on the alternative route, toward the park gates on the outskirts of Canmore. This path runs parallel with Highway #1 and is fairly flat. This was good because the day started to heat up and I was beginning to suffer. Being an out and back course we cheered on the front runners as they blew past us and wished that we were that much closer to the finish. At the 32km mark Vince and I were passed by a woman dressed in green. She stopped a few metres in front of us and introduced herself as Lindsay Woodcock. She said she had read my book MARATHON QUEST and that it had inspired her to run, her first, marathon. Fantastic. Vince and I said goodbye to Lindsay and we plodded on. We were now both paying a price for the hot weather and were very happy to reach the finish line. The inaugural Banff marathon was in the bag. Beautiful day, well organized and great people. I will definitely be back for next year’s event and maybe this time we can run the planned route. Third time’s the charm. At least seven grizzly bears are spending time around the Banff townsite, prompting officials to extend a warning that was issued a couple of weeks ago and change the route of the Banff Marathon on Sunday. The warning has led to a route change for Sunday’s Banff Marathon, running for its first year after it was cancelled last year due to the June flood. 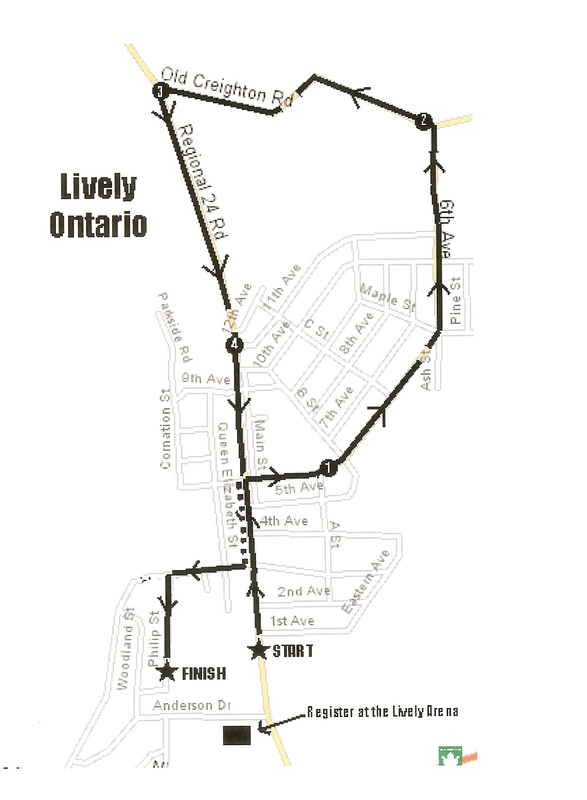 Instead of going down Vermilion Lakes Road, the race will now head in an easterly direction toward Canmore on the Legacy Trail. Our 2nd attempt at being the first to run a half and marathon in Banff came off almost without a hitch. Last year the Rocks!! 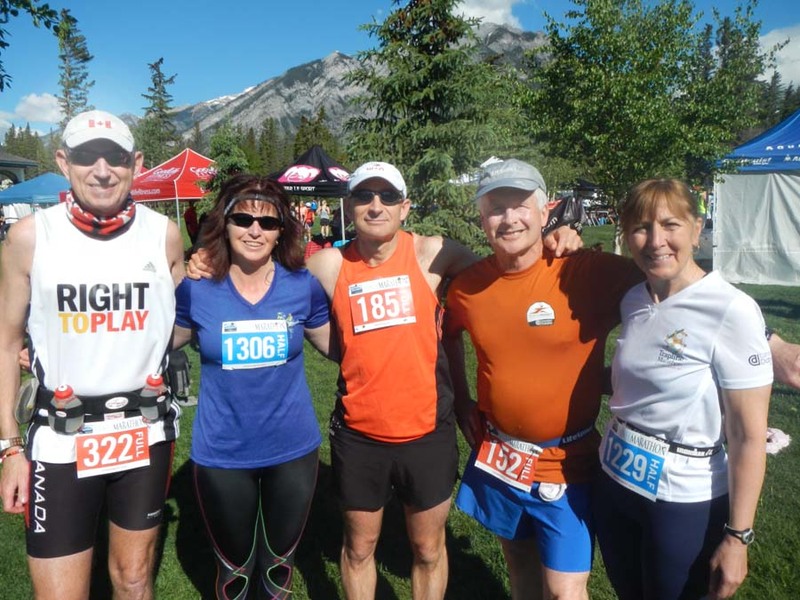 group of Lise Perdue, Lynn Stubbings, Ken Stubbings and Vince Perdue travelled to Alberta to run the inaugural event. Our plan is to run a marathon (men) or half (ladies) in each province and territory. What a phenomenal setting to add the province of Alberta to our done list. Unfortunately the rains and floods came ending that 2013 chance. No problem though. We just took the opportunity to have 2 excellent trips to the western mountains and it was surely worth the effort. The only hitch as Martin noted above was the route change the day before the run. We actually were made aware by an email from the run director as we were scouting the western course on the Bow Valley Parkway. No problem as the "Plan B" course is beautiful and actually easier with only a few real hills. I usually run alone in marathons unless I'm pacing someone but this run was different. Martin and I stayed together for the duration and his 'Right to Play' reputation had a few people jump on with us on different occasions to brush with fame. We got many shout outs along the way, 99 Martin to 1 Vince. A fellow I met in the Nunavut's marathon saw me and was kind enough to say hello. Thank you Jim for keeping my ego intact. What a great run.Well organized and lots of positive vibes.The location and views just put it way over the top. If you like destination marathons, this one should be high on your bucket list. 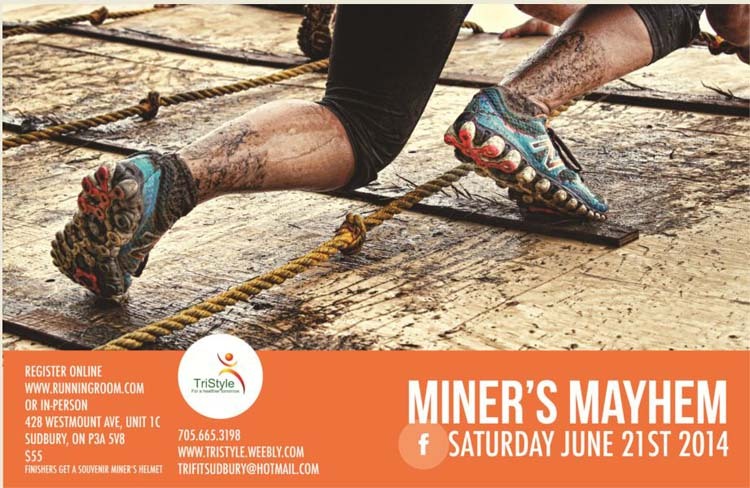 For 18-year-old Karly Marcotte, her first time participating in the Miner's Mayhem race on June 21 was just her way of testing it out. She wasn't there to compete with the top runners. She was there to have fun and run with her friends. “It was a challenge, and instead of running the entire time, it was fun to have all the obstacles along the course,” she said. “For future runs, I would like to do it more competitively.” Climbing to the top of Adanac ski hill was the most challenging part of the course she said. Funds raised at this year's Miner's Mayhem will support Minds in Motion, a project under the Alzheimer Society of Sudbury-Manitoulin designed to help patients with dementia spend more time with their caregiver. Sunday June 23rd marked the 3rd event in the Sudbury Fitness Challenge. Competitors broke out their paddling gear in hopes of gaining sufficient points to increase their ranking. The weather couldn’t have been better for a day on the waters of Lake Ramsey. Hot and sunny and very calm conditions made for happy paddlers, although likely a bit sunburned too. A big thanks to Rob Marcolini and the Sudbury Canoe Club for hosting the canoe marathon. Rob is always a very animated race director, and the prizes are well worth sticking around for. There was a great turnout, and many newcomers to the event, including Laurel Myers, who is on a quest to participate in every Fitness Challenge event. Laurel excelled in the kayak category, winning the 4k event outright!!! In true spirit of the Fitness Challenge, there were events and distances for everyone, from 4km to 9km to a full 18.5km (which is actually 20 km Rob!). Paddlers are welcome to use canoes, kayaks, racing shells, and we even had a stand-up paddle boarder this year! Neil and I just invested in a brand new ultra-light canoe, and in its honour, I decided to sign us up for the super long haul distance. This was a brand new challenge for us, having always paddled the 9km course. I always say that if a couple can canoe together, they can get through anything that life throws your way. I’m very happy to report that Neil and I not only ‘got through it’, but we actually had an amazing time out there together. Neil, you definitely earned your DQ Dilly Bar this year J. As a runner, my Canada Day rituals would likely make many Canadians cringe. Rather than spending the day on the water with a drink in 1 hand and a very bad for you snack in the other, I stay out of the sun and definitely away from the snacks. This rather ‘boring’ day is all in preparation for my evening celebrations – the Canada Day Firecracker 5k race. 2014 marked my 5th time racing the Firecracker, and it was definitely worth spending the day laying low. The Firecracker will likely be my last 5k race before my goal event in September, and I wanted to see how my training was progressing. My goal was to take 20 seconds off my Sudbury Rocks!! 5k time in May. Neil is fighting an injury following last week’s Twilight meet, and wasn’t sure he could race last night, so he offered to pace me. What a treat! I’ve never been paced in a 5k before, and was pretty excited to have Neil there to push me. I put my trust in Neil, and decided not to look at my Garmin at all – something I’ve never done before. I was a bit concerned as we finished the first km, as I was having trouble settling into the pace, but then I relaxed and managed to find my comfort in the un-comfort. The last km was a real struggle, but Neil’s constant words of encouragement helped me push through. I looked at the clock as I neared the finish, and was very excited to see I was a bit ahead of my goal – and I actually finished a full 10 seconds faster! Thanks so much Neil, for your support – both on and off the race course! I love being able to celebrate Canada Day doing what I love to do! I had a really good July 1st 10km run through the Moonbeam nature trails. Everybody started at the Community Center on Albert Street, run along the Golf Course and into the forest on a paved path the whole way. I didn’t see any wild life but lots of wild roses along the way. Very well organized and lots of happy volunteers along the way. Registration is actually free. Happy Canada Day!!! "The goal of this 5th annual event is to encourage people to participate and enjoy the beautiful surroundings of Remi Lake, Rene Brunelle Provincial Park and the Moonbeam Nature Trails. Runners and walkers alike are encouraged to test their limits or stretch their legs in this wonderful event." The Sudbury Fitness Challenge is a series of seven athletic events that take place each year in the City of Greater Sudbury area. The Challenge consists of the following events: Sofie Manarin Nickel Loppet, SudburyRocks!!! Race, Run or Walk for Diabetes, Canoe Marathon, Ian McCloy Island Swim, Mountain Bike Tour, Beaton Classic and Youth Triathlon, and the Walden Turkey Gobbler and Nature Walk. These events are offered to promote the value of an active and healthy lifestyle through participation in physical activity. Don't get left behind! 3 events are already complete. But there are still more chances to challenge your friends and rivals in the quest to become Mr. or Ms. Fit. There are youth categories, overall categories and age group categories. Island Swim is booked for Sunday July 20th, 2014. Celebrate swimming and Sudbury’s Lake Nepahwin at the Ian McCloy 31th annual Island Swim on Sunday, July 20. The swim features events for children and adults, including a 100-metre youth swim, 500-m, 1.6-kilometre and 3.2-kilometre swim challenges.